Outside Counsel Management and Rationalization (OCR) is an approach adopted by many leading corporate legal groups to improve quality and reduce costs. OCR is designed to select and utilize optimal outside counsel for diverse legal needs. Centrally located in the vibrant and historic Beacon Hill neighborhood of Boston, the Charles Street Meeting House offers an array of cultural and historical opportunities for the curious traveler and hungry historian. The charming shops, cafes, and historical sites that line the cobbled streets of Beacon Hill consume visitors of Boston and encourage them to immerse themselves in the history surrounding them. One of the oldest neighborhoods in America, Beacon Hill has become a pillar in the Boston community and has mirrored the growth and transformation of the city, while successfully maintaining its famous charm. The historic Charles Street Meeting House has transformed over its 200+ years of existence and has remained true to its name, serving as a meeting spot and identifiable landmark at the crossroads of a vibrant urban community. A central part of the historic Boston neighborhood, the Meeting House personifies the identity of the Beacon Hill Community, and offers much more to visitors and community members than the history blurbs currently found across the web. It's central location in the Beacon Hill neighborhood, coupled with its rich history and welcoming nature allows the Charles Street Meeting House to capture the true essence of the historic neighborhood. Identifiable by its prominent location and towering octagonal cupola that has become a key landmark in the Beacon Hill neighborhood, the Charles Street Meeting House is as diverse as the neighborhood it is immersed in. The iconic building has lived many lives throughout its time, which began in 1807. While the upper floors serve as offices for local businesses in consulting, wealth management, and renewable energy among others, the street level invites tourists to explore the historic monument with its warm café and quaint shops. While there is undoubtedly a rich history bred within the walls of the Meeting House, the building has transformed into a central figure in the community. The essence of the Meeting House is more than just the structure itself - it is a vibrant meeting spot for community members, an architectural wonder, a place to reflect on the history of the Beacon Hill neighborhood and the building itself, or simply a spot to enjoy one of the best cups of coffee in the city. Located on the ground level of the Meeting house on the corner of Charles and Mount Vernon Streets resides Café Vanille, a critically acclaimed coffee shop that boasts some of the best French coffee in the city. From the time Café Vanille arrived at the Meeting House space in 1999, it has solidified itself as the community’s go-to coffee shop for residents and visitors alike, as evidenced through their Best of Boston awards in 2005, 2007, 2009, and most recently in 2011. Café Vanille also proved it wasn’t a one trick pony, winning the Best of Boston pastry award in 2010. Visitors will realize this when the smell of freshly baked croissants and flaky napoleons greet them at the door. The attention to detail shown in their pastry’s and baked items offers patrons a refreshing opportunity to experience a true French café, with bakery items that have been baked not micro waved, and rich coffee that serves as a pick me up for many everyday. 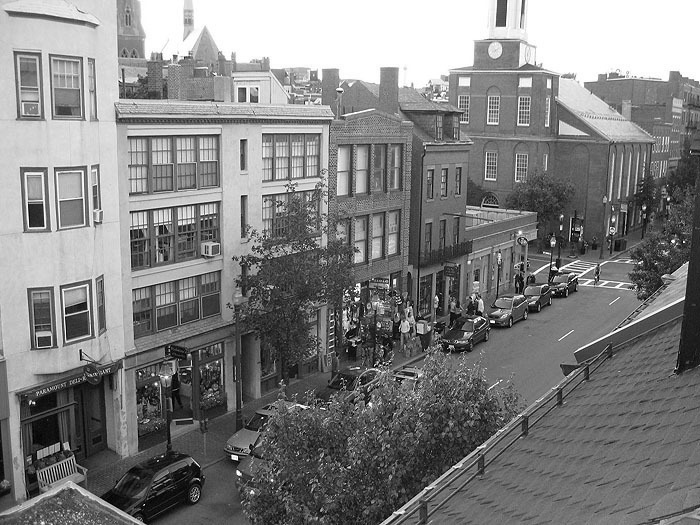 In the sunny spring and summer, the outdoor seating gives visitors a chance to look up and down Beacon Hill’s famous Charles Street all the while being protected by the shade provided by the historic Meeting House. Just steps across the street from the Meeting House is Gary Drug Co. whose motto “If we don’t have it, you don’t need it” is indicative of the specialty drug store that harkens back to the early 20th century. A mainstay in the Beacon Hill community since 1934, the shop boasts a full service pharmacy, while also providing the community and tourists with a personal and cozy shopping experience. Priding themselves on the customer service that has persisted through their 75 years of existence, Gary Drug Co. provides visitors with a welcoming experience, much like that of Café Vanille across the street. The friendly staff and impressive selection make it easy for tourists and community members to understand why Gary Drug Co. is one of the last of a dying breed, an independent pharmacy in the age of pharmacy superstores. Gary Drug’s attention to detail and historic feel has solidified itself as a mainstay in the Beacon Hill Community and a prominent stop for the neighborhood’s visitors. Looking for a place to grab a drink after work? The Sevens, just steps from the Charles Street Meeting House, serves as a popular spot for professionals, community members, and visitors to relax after work or quench the thirst of a parched tourist visiting the historic Boston neighborhood. The famous Reuben sandwich, and vast array of beer choices has made the Sevens a Beacon Hill favorite for decades. A homely place for drinks and food, The Sevens mirrors the character and history of Beacon Hill. Quite literally in the shadows of the Charles Street Meeting House, the dartboards and informal atmosphere are cozy and inviting, making it one of the historic neighborhoods go-to spots to hangout. For a quick bite to eat, Panificio's provides visitors and community members alike with quality and timely meals. Located on historic Charles Street at the foot of Beacon Hill, Panificio's offers delicious pizza and sandwiches. In line with the spirit of Beacon Hill, the quaint bistro remains open for three meals a day, offering convenient and delicious meals no matter what time of day visitors stroll through. The smoked salmon Benedict has made Panificio's breakfast and brunch popular times of day for both regulars and new visitors each day. Hearty portions and a low-key dining experience make Panificio's the perfect spot for visitors looking to stop in and grab a quick bite to eat while they make their voyage through the specialty shops and historic sites that line the streets of Beacon Hill. Part of the popularity of the Meeting House and the Beacon Hill neighborhood as a whole is derived by the central location and ease of access. Tourists utilizing the city's public transportation will find themselves in the Beacon Hill Community by taking the MBTA's Redline to the Charles/MGH stop. A brief walk up Charles Street for about three blocks will be the Meeting House, a central figure to the community and recognizable in the neighborhoods skyline. In the warm months the area will surely be bustling with curious travelers stationed at the outdoor patio at Cafe Vanille. With it's central location between the Boston Common and the Charles River, enjoying a coffee on Vanille's patio allows visitors to see both the water and the bustling Common. The vibrant community has maintained its charm through the years, as evidenced by the numerous quaint shops that line Charles Street, and the cobbled side streets that elicit memories of the days of horse and buggy. Built in 1807 under the guidance of renowned American architect Asher Benjamin, its primary function was as a meeting place for the Third Baptist Church. Additionally, in the years preceding the Civil War the Meeting House hosted a variety of anti-slavery activists and became a central location in the abolitionist movement. The Meeting House served as the location to pivotal speeches and rallies by historical figures like Frederick Douglas, William Lloyd Garrison, Harriet Tubman, and Sojourner Truth. As a result of these groundbreaking speakers at the height of the abolitionist movement, the Charles Street Meeting House cemented itself in history as a pivotal location in the anti-slavery efforts. To this end, the Meeting House is recognized by numerous historical societies, including the National Register of Historic Places, the National Trust for Historic Preservation while also being a recognized site on the Boston Black Heritage Trail. Early on its existence the Meeting House became a key focal point in the Beacon Hill community, and it has since remained firmly entrenched in the historic Boston community. It has adapted alongside the neighborhood it belongs in, even quite literally, having to be moved ten feet towards the Charles River in 1920 to accommodate the widening of Charles Street! The Meeting House in its original capacity. The Charles Street Meeting House began its secular life when the Charles Street Meeting House Associates purchased it in 1980. The restoration and transformation of the old Church began in 1981 and was completed by 1982 with exterior renovations as well as interior renovations that provided office, retail and residential space within the hallowed walls. Rich with history, the Charles Street Meeting House offers visitors an opportunity to transport themselves into the heart of the abolitionist movement, imagining the leaders of the movement such as Sojourner Truth using the building as a rallying point to what would become a pivotal point in United States history. While the blurbs about the Charles Street Meeting House in historical records offer historians and tourists a brief overview of the building, they do not accurately depict the meaning of the building itself. Its central location in the bustling Beacon Hill neighborhood, has transformed the building into more than just an historical site. Instead, the Charles Street Meeting House has entrenched itself into the fabric of the community- providing community members with a popular meeting spot, and serving as a landmark and worthwhile stop on any tourist's adventures!